Stations 4 and 18 responded to a high speed MVC in the 2900 Block of Red Root Road, south of Blakely Lane, Saturday 28-February at 2136. The small car left the right shoulder and struck several trees before apparently flipping even over end, before landing back in the roadway. The driver received possible head injuries, as well as other trauma injuries. He was not wearing a seatbelt. Click here for more information. 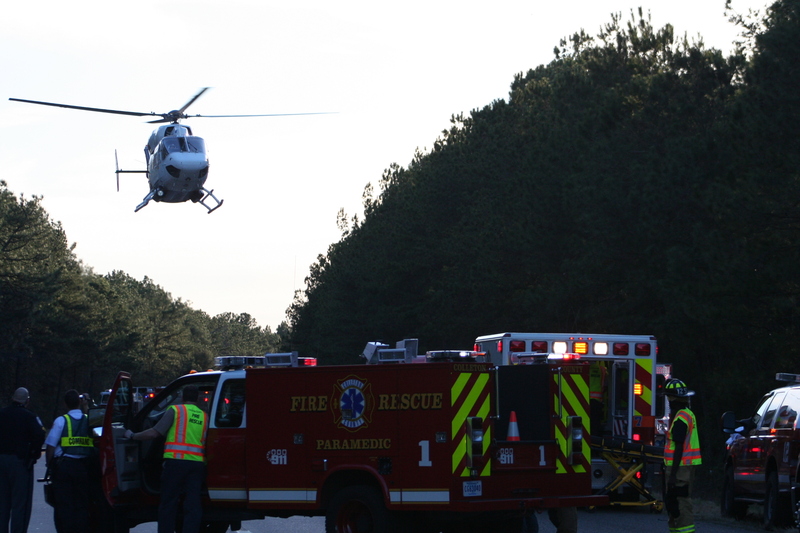 Stations 1 and 19 responded to a fatal single crash in the 1000 block of Industrial Road, Wednesday evening at 2023. The eastbound car was estimated to be traveling over 100 mph, when it dropped off the right shoulder. The 36 year old driver over-corrected and went into the west bound ditch after sliding sideways. He struck a driveway culvert and began overturning. The car flipped over at least three times before coming to rest on its roof near a patch of woods. Click here for more information. It is with deep regret that we inform you of the death of Wendell Polk, father of Fire Commission Chairman LaVern Polk and Firefighter Carroll Polk, who passed away Monday afternoon at a Charleston Hospital. Mr. Polk had been a long time member of Station # 15 in the Islandton Community and is one of three generations of the Polk family serving as firefighters in that community. Visitation will be held Wednesday evening from 1800 to 2100 at Herndon Funeral Home (1193 Bells Hwy, Walterboro). The funeral service will be conducted at Rice Patch Christian Church, 15246 Sniders Hwy, Islandton on Thursday afternoon at 1500. 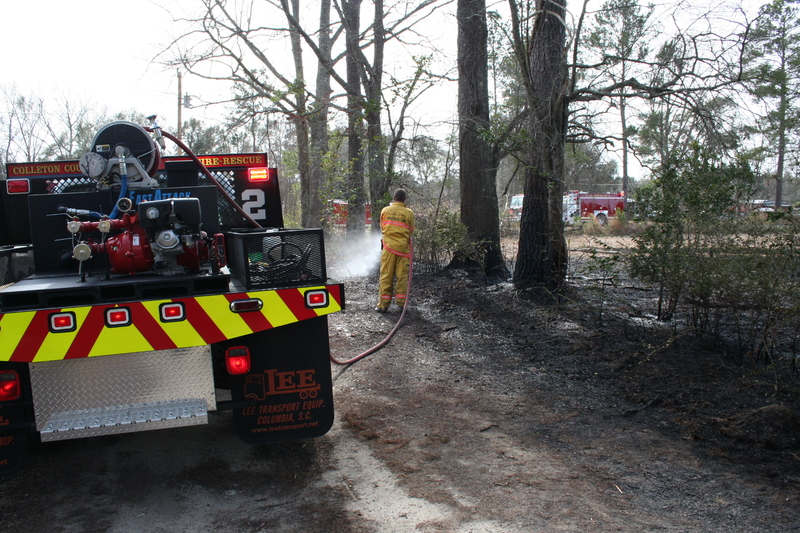 Fire-Rescue and Forestry units responded to a second large woods fire in the 500 block of Bowman Lane at 1340 on Sunday afternoon 22-February. Also driven by high winds, the fire spread near multiple structures and burned approximately 7 acres of woods, grass and a small field. 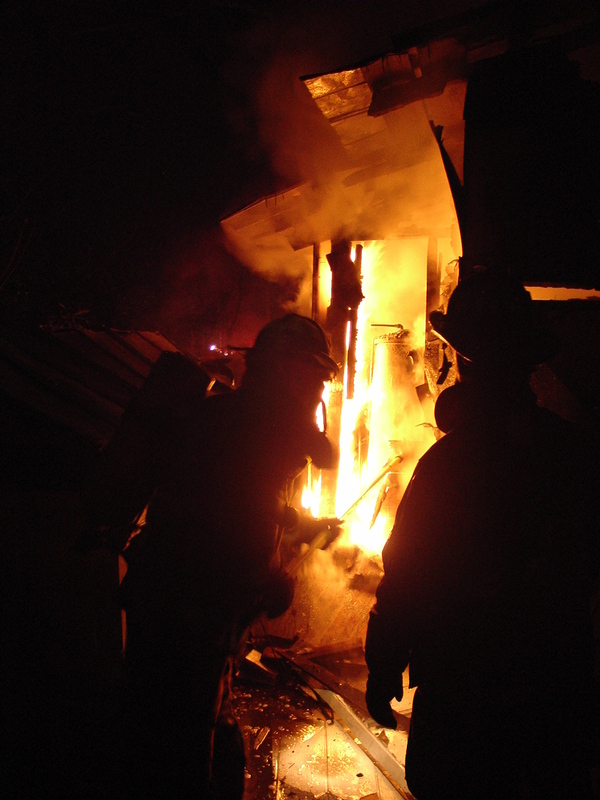 Multiple stations were dispatched on the first alarm,.... click here for more information. 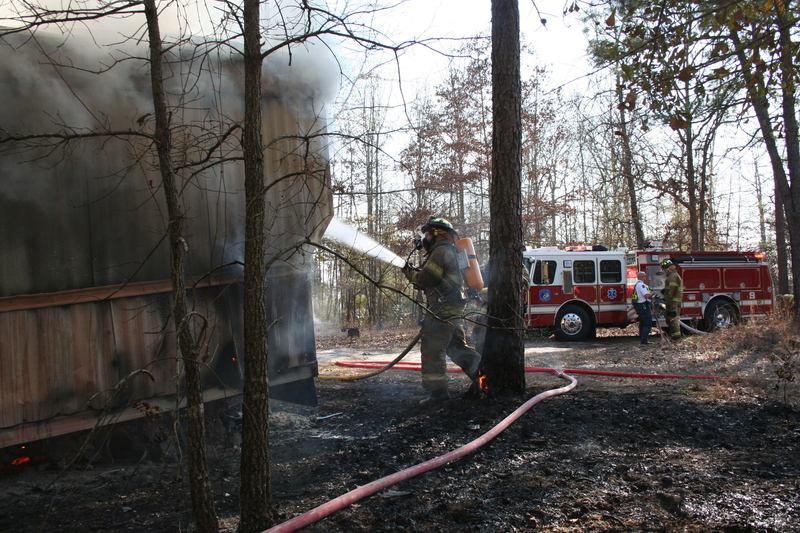 Woods fires and high winds kept firefighters busy Sunday afternoon 22-February. The first of the two largest fires was received at 1222 reporting a car fire at 840 Cromwell Lane. Engine 19 and Medic 19 arrived to find a fully involved passenger car with a rapidly spreading woods fire endangering three structures. The doublewide mobile home at the address received damage to the vinyl siding on the “B” side, with the underpinning burned away. Click here for more info. On 21-February at 1107, Stations 1, 5, 19 and 26 responded to a single car MVC in the 1000 block of Maple Ridge Road. The vehicle appeared to have the left the roadway in a curve overturning one time. The driver was wearing a seatbelt, however suffered suspected multiple trauma injuries. A telephone pedestal was damaged in the collision. Click here for more information. At 0717, Saturday 21-February, Stations 1 , 26 and 27 responded to a high speed, single car MVC on Evergreen Lane. Initial callers reported the vehicle had struck a tree, was on fire and had children trapped inside. Fire-Rescue units were on the scene within five minutes to find a heavily damaged car against a tree. The car was fully involved. Bystanders had pulled a 22 year old male from the burning vehicle... click here for more information. Battalion Chief Dan Barb conducted a fire prevention and job fair display at the Whitesville Elementary School in Berkeley County Thursday 19-February from 0800 to 1400. The demonstration was part of the school’s annual career day which is designed to expose the children to job opportunities and give them the chance to ask questions from personnel in those fields. Chief Barb’s son Garrick attends Whitesville Elementary, so he was invited by one of Garrick’s teachers. Click here for more information. 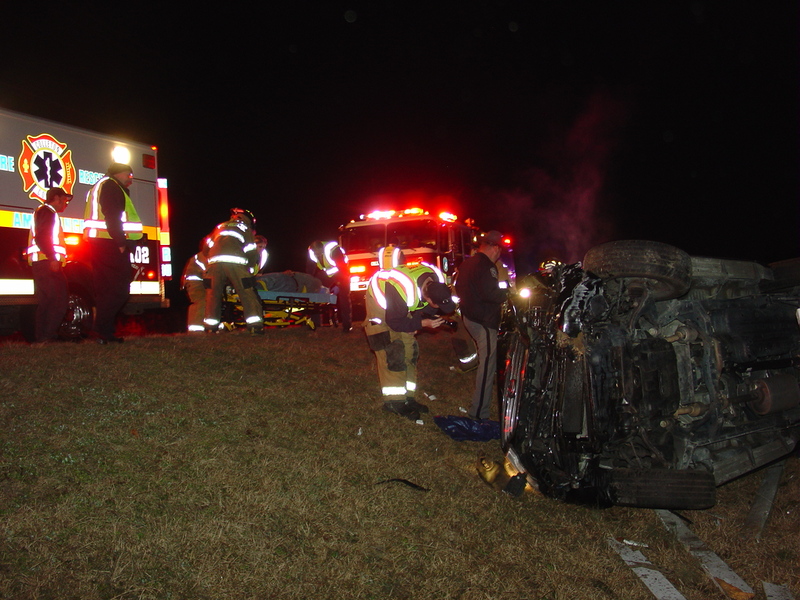 Stations 1, 19 and 26 responded to a three vehicle high speed MVC on I-95 at the 61 mile marker southbound at 2222 hours, Wednesday 18-February. Apparently a southbound tractor trailer struck the rear of a older model Ford Ranger Pickup truck that was being towed by a southbound dump truck. The collision caused heavy damage to the small pickup truck as the impact forced the dump truck off of the right side of the highway. Click here for more information. Stations 5, 9, 19, and 27 responded to a house and woods fire in the 1700 block of Wesley Chapel Ave. at 1747, Tuesday 17-February. The fire had evidently been burning for sometime before a motorist reported the fire on this isolated stretch of rural road, northwest of Cottageville. Engine 9 and Medic 9 were on scene in 7 minutes, reporting a large fast moving woods/field fire with a doublewide mobile home almost completely destroyed. Click here for more information. 2/15/2009 - A fund has been established by the Green Pond Baptist Church to assist the family of Station # 2 Captain Shane Rushton. Captain Rushton’s 9 year old daughter Ainsley will be having spinal surgery at Shriner’s Hospital in Philadelphia, PA in March. 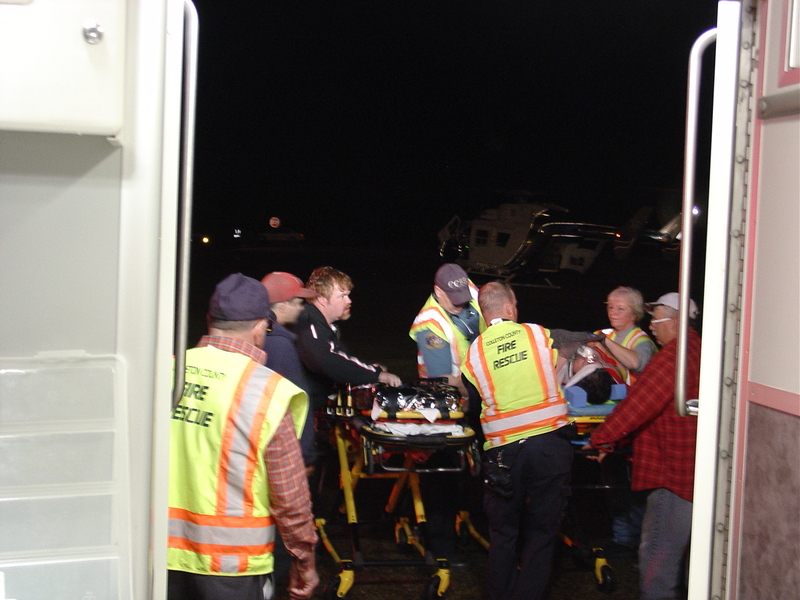 Following the surgery she will have to be transported home by private plane. The church is raising funds to assist the family while they stay for several weeks in Philadelphia and with the cost of the transportation expenses. If you are able to make a donation, please mail it to the Green Pond Baptist Church. Note on the check that it is for the Ainsley Rushton Fund. Donations can be mailed to: Green Pond Baptist Church, PO Box 265, Green Pond, SC 29446. They note the donations are tax deductible. Stations 1, 6, 8 and 27 responded to a well involved structure fire at 11116 Combahee Road, Saturday morning 14-February at 0030. The home is located south of the community of Hendersonville. A Highway Patrol Trooper was on scene with minutes, followed shortly by Engine 8. They indicated a 30% involved doublewide mobile home with flames already through the roof. A neighbor spotted the flames in this remote area after his power went out. Click here for more information. 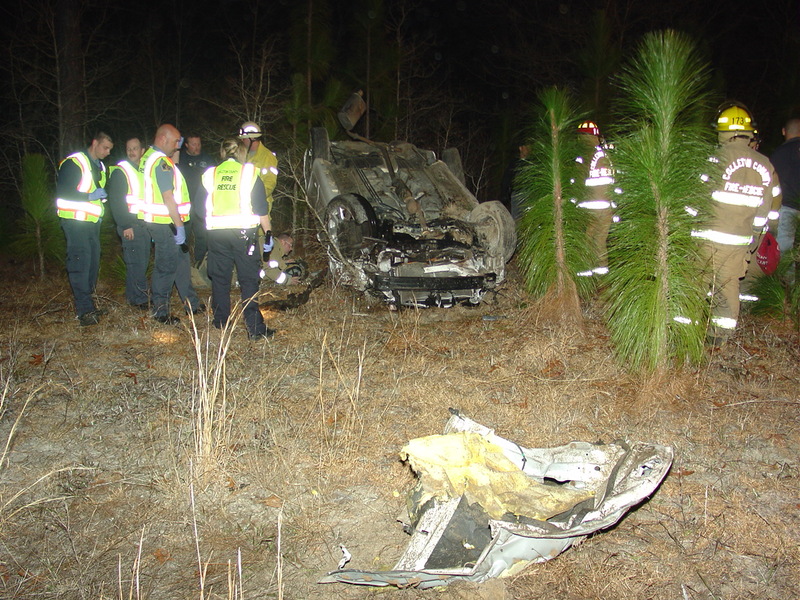 Stations 1, 13, 19 and 27 responded to a high speed single car MVC on I-95 at the 47 mile marker southbound at 1620, Thursday 12-February. 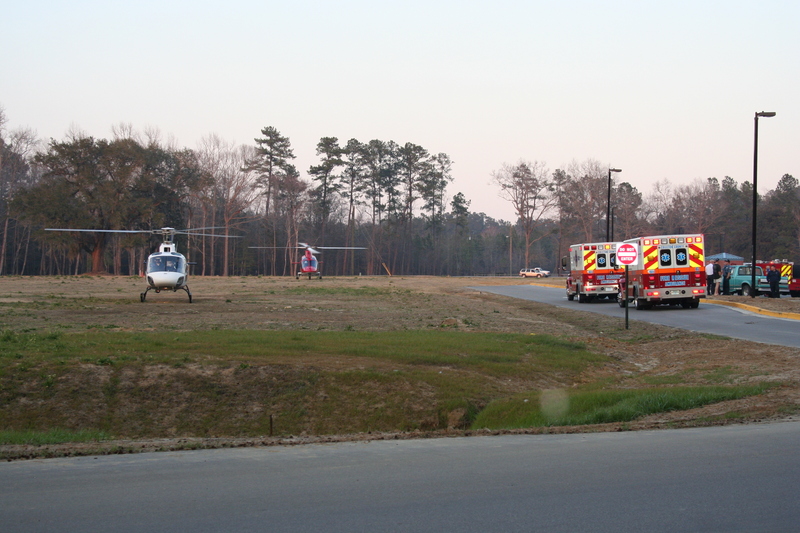 The accident occurred approximately ½ mile south of the Rest Area. Apparently the southbound Mercury Mountaineer suffered a blown rear tire, which caused the driver to lose control. The vehicle flipped over two times coming to rest on its roof at the wood line on the right shoulder. Click here for more information. Stations 1, 6, 8, 13, 25, 27 responded to a large rapidly moving brush and woods fire in the 1100 block of Black Creek Road in the Hendersonville Community at 1420, Tuesday 10-February. 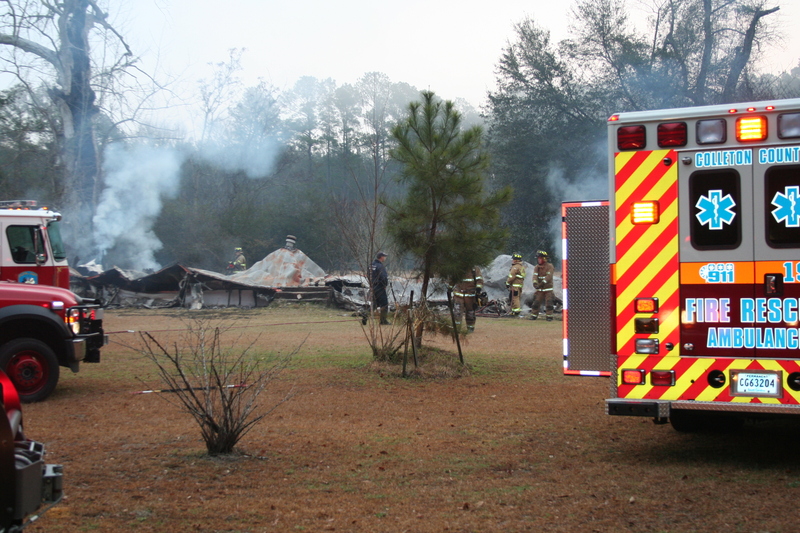 Initial reports to 9-1-1 indicated a woods fire near 1149 Black Creek Road. 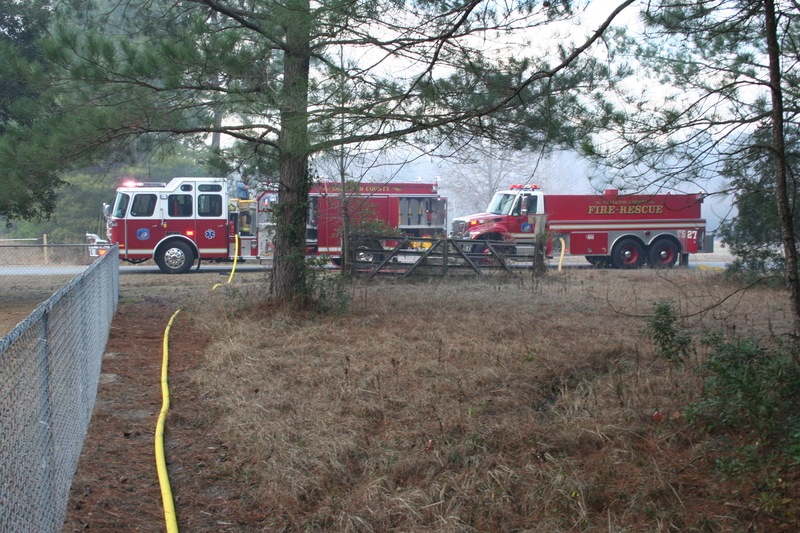 Engine 8 and Engine 13 arrived to find a rapidly moving field fire that had already entered a wooded area. Click here for more information. 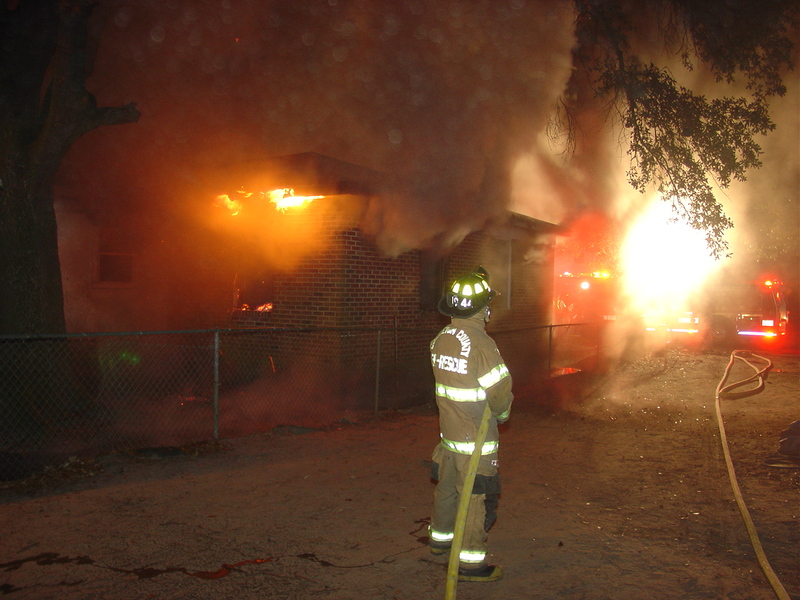 Stations 1, 19, 24, 26 and City of Walterboro Public Safety units responded to a house fire at 221 Lincoln Street at 2324, Monday evening 9-February. Engine 19 arrived to find heavy fire conditions in the rear of the structure with flames blowing out of two windows of a rear bedroom. Thick black smoke rolled into the street as firefighters made entry into the structure with one 1-3/4” handline. Crews found a rear bedroom well involved and were able to bring the fire under control within minutes. Click here for more information. Stations 1, 6, 9, 19 and 27 responded to a high speed, two car head-on MVC on Cottageville Hwy. (US Hwy. 17-A) near Sullivan’s Landing Road Sunday, 8-February at 1609. Both vehicles received heavy damage in the collision. The female driver of the Grand Marquis was trapped in her overturned vehicle. Click here for more information. Stations 1 and 19 responded to a MVC with entrapment on Cottageville Hwy. east of Phillips Road 8-February at 0253. A westbound Lexus SUV failed to negotiate the curve and left the right side of the road striking a driveway culvert. The car then flipped end over end twice striking a wooden fence. The car came to rest on the driver’s side. The driver received several non-life threatening trauma injuries. Click here for more information. Stations 5, 9, 11, 19 and 27 responded to a structure fire with entrapment at 546 Brocktown Road north of Cottageville at 2224, 6-February. Callers reported a 98 year old female was trapped in the residence. A Cottageville Police Officer arrived about 4 minutes later reporting the home was well involved. She obtained information from bystanders on a possible location of the woman inside the residence and relayed the information to fire units. Witnesses stated, a neighbor by the name of David Green (not our Asst. Chief) broke out several windows in an attempt to locate the 98 year old resident. After not hearing any replies, he went the rear of the burning structure and crawled inside roughly ten feet in an effort to find the woman. He couldn’t breathe due to the smoke and was driven out by the intense heat of the fire. Following his heroic efforts he appeared to be suffering from smoke inhalation but denied medical assistance from Firefighter-Paramedics. Click here for more information. Stations 5, 17, 19 and 26 responded to multiple fires at 3234 Burlington Road in the Pleasant Grove Community at 1537, 6-January. The original fire was reported to have been a trash pile fire that got away from the landowner. Light winds quickly spread the fire into nearby broom straw, which rapidly ignited and spread to a nearby vacant mobile home and two vehicles. Click here for more information. Congratulations to Firefighter/EMT Linda Hoff on passing her EMT-Intermediate testing. Stations 9 and 19 responded to a suspected Methamphetamine Laboratory in a residence on Round O Road at 0840, Wednesday 04-February. Colleton County Sheriff's Department and Drug Enforcement Agency personnel cleared the residence finding no one inside. 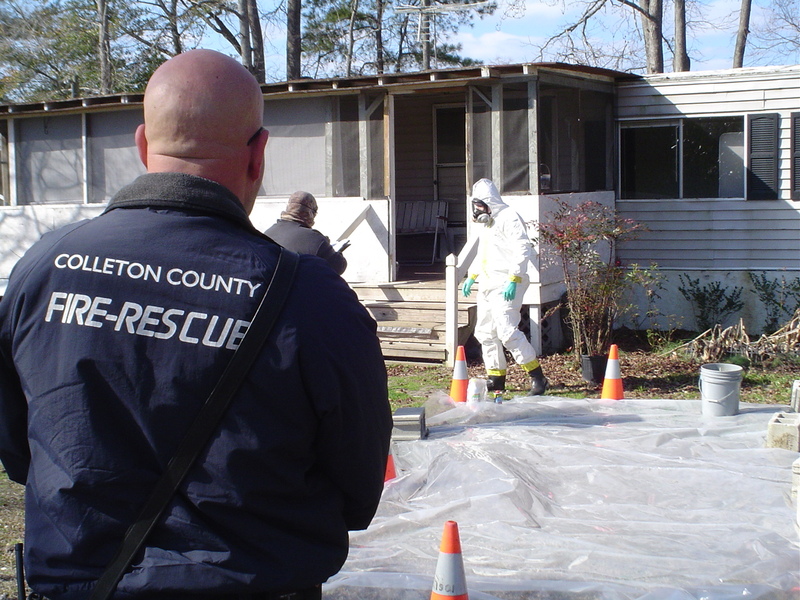 Fire-Rescue personnel provided decontamination, rapid intervention and medical monitoring while law enforcement personnel dismantled the operation. Click here for more information. 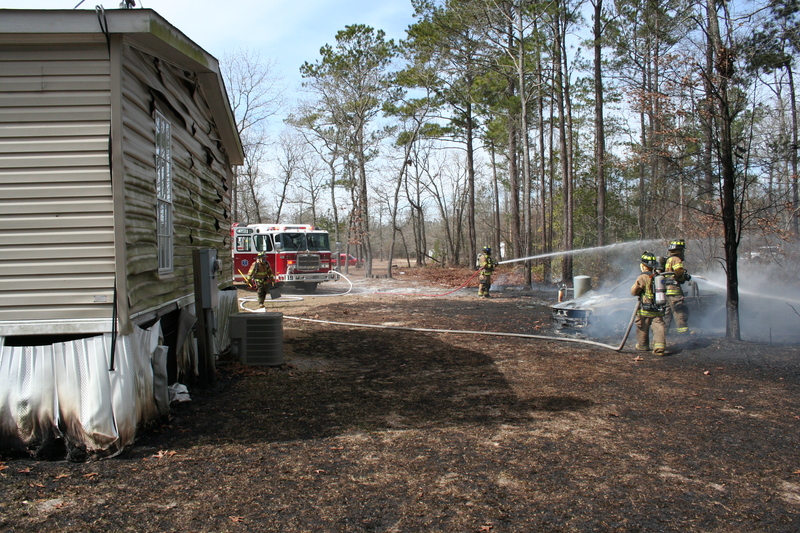 Stations 9, 5, 19, 24, 27 responded to a structure fire at 1606 Coolers Dairy Road at 0720, Monday 02-February. A school bus driver reported seeing flames at the home as she worked her route. The house was located in an isolated area and sat about 200 feet off of the road behind some trees. Engine 19 arrived to find the singlewide mobile completely destroyed and barely smoldering. Click here for more information.